Norwegian Cruise Line is a worldwide cruise and shipping line. With a fleet of 15 and 2016 First Quarter Earnings of 1.1billionUSD, NCL employees over 10,000 people worldwide. It publicly traded on NASDQ:NCLH. To reach Guest Relations call 1-866-234-7350 or you can send a Case Submission online here.To write a letter to President and CEO, Kevin Sheehan, address an envelop with NCL Headquarters, Airport Corporate Center, 7665 Corporate Center Drive, Miami, FL 33126, USA. Offering cruises for families, singles, casino theme, music theme and with and without shore excursions NCL has social presence on Facebook, YouTube, Instagram and Google+. Hi I want to start off by saying this was the worst cruise I went on , we were late getting on the cruise was not explained to us on why and when we got on the ship go to find out that the zip line was under maintenance and the slides were not available and to say that my family also was also kicked out of the pool because we were not allowed because Security guards told us told us for adults only . my daughter is 13 years old and Ipaid full price for her and to be told that she could not go in to the pool . And my husband planned this for my daughter spring break vacation and it was her birthday present . Overall this was a big disappointment for the whole family worst experience ever . I’ll never cruise again with this cruise . All I’m asking is to get a full refund back I need someone to get in contact with me my phone number it’s 860-751-4300 as soon as possible and my name is Elida Nuredin , my email is elidabmw@hotmail.com I did talk to someone in customer service and they told me just to gave my claim # is 265222 . It Will Be greatly appreciate if someone to contact me or email thank you. letter in our stateroom stating we did not attend and had to meet someone the next morning to go over the safety drill again. On day 2, we wanted to attend the canvas by U activity. When I went to guest services to inquire about it I was told by 3 different people I did’nt need a reservation. All I needed was to get to the location early. So I arrive 40 minutes prior to the event and we are the 2nd group in line(party of 2 was in front of us). Well when the doors open ‪at 12:59pm‬ we’re told to make 2 lines, 1 for reservations and 1 for standby. We were completely flabbergasted since we were advised reservation was not necessary to attend the event. Well low and behold we did not get in as after everyone who reserved spots there was only two spots open, which went to the party in front of us. Upon returning to guest services to try to understand why I had to waste 40 minutes standing in line for nothing(not to mention having to explain to my upset son why he couldn’t get in) I was told that there would be another one the next day, well that doesn’t help me since we already had an excursion booked. I then asked to speak to a manager, I was told she wasn’t available and if I give my stateroom number she would call me back(not sure why they thought I was gonna waste more time sitting in my stateroom for a call) although while giving my stateroom number the guest relations representative got a call and passed the phone to me. She informed me that she was the asst cruise director Sandra and was of no help whatsoever and I hung up on her shortly after she advised that guest relations doesn’t know about canvas by u. Well in my opinion guest relations should know about everything going on since they are the point of contact for your guests/customers. We rented a villa on the island of great stirrup cay, part of the excursion was a $50 credit towards food at the villa. We selected 2 sushi platters($42.00 total) well the sushi never showed and we were advised that there was a mishap and they would issue us the credit back. So I see the debit and credit and then an additional $50 onboard credit . Then 2 days later the charge reappears. Well I go to customer service and I was told by the guest services representative that she would have to check with the restaurant because she cannot just take my word for it. I guess the phrase “the customer is always right” is not something Norwegian believes in. The right thing to do would have been to issue the credit back and then verify with the restaurant so as not to further inconvenience your customer/guest. On day 6 were eating dinner at taste restaurant and my son finds a hair in his Caesar salad, my wife also finds a hair in her shrimp Louie. Well we call the waitress over to show her and she takes the plates and then delivers a Caesar salad to my wife, well after taking the first bite she notices a bug in her salad, just then a gentleman walks up to the table(not sure if he was the dining manager because he never introduced himself). He apologized and asked if he could get us some complimentary wine for the table, well my wife advised him that we don’t drink wine. He then stated that he would send something to our stateroom and apologized for the inconvenience once again. Unfortunately we never received anything in our stateroom. We traveled on Norwegian Escape from 3/24/19 to 3/31/19 from NYC to Bahamas and back. Upon returning, one luggage was damaged during the last night pickup. When we picked up our luggage on the pier, the duffle bag was torn open and many of its contents were damaged and pilled around the duffle. We had to catch our group transportation and we scooped the items and packed them back into the ripped open duffle and proceeded to customs. Upon arriving home, we realized the extent of the damage. A stainless steel drink container was crushed and ripped apart. A mirror was broken, a curling iron was broken apart and would no longer operate, a brand new book had its binding broken, two pair of shoes were cut and bent out of shape. Also, our cosmetics were crushed and coated the duffle and some items. The duffle bag and a jacket had black grease on various areas. The duffle and the damaged items are unusable. Please see attached photos. We are Silver Latitude members and have been cruising for 25 years and are sure you will be able to reconcile this matter. I was on a cruise from Manhattan reservation #40035698 3/3/19 - 3/10/10 and me and my wife was thrown out of bed onto the floor. My wife has brusies from landing on the floor and I am still sore. Also we were not able to visit your island in the Bahamas which we were looking forward to seeing and on top of all that I became very sick one day and my wife the very next day. Although the mishaps happed their were so good times and the staff was outstanding. I am hoping for some kind of compensation. While traveling aboard Norwegian Star 8 day Mexican Rivera cruise ship on March 1, 2019, we experienced racial slurs, abhorrent and flagrant language from other passengers while onboard the ship. The most egregious experience took place while at the Italy restaurant, La Cucina. While canceling my reservation at La Cucina Restaurant on the 7th floor, I was insulated by a fellow passenger. I was speaking with the host and canceled my reservation. A passenger came up to the front and stood less than three foot from me. I turn and said excused me. He referred to me as a four letter word. The passenger continued with other obscenities as well as the N word. I than reported the incident to the the manager of the restaurant manager; he deferred me to the Purser's Desk. I spoke to one of the supervisor's and informed him of the chaos. Immediately, the customer service supervisor contacted security and the host of the restaurant concerning the matter. With in minutes, security reported to the Purser's Desk and took my statement (I wrote up the incident). At this time, the complaint is under investigation. I am hopefully that this incident will be addressed and there will be a positive outcome. ANdrea Pollard is handling this case. When I call. She is away from her desk. On a break. Not around. Is overworked 27 ahead of me last week, Today 25 ahead. Can not talk to her boss or anyone above her...no one takes calls. On hold today 34 minutes & nothing was resolved. Almost 2 months & NO REPLY YET? Norweigan took several cruise incl Alaska & took someone..yet NO customer service..that's a disgrace. Cruise res. 39303512. My husband and I went on a cruise with your company (Escape) from New York to the Caribbean Jan6-20 2019. During the cruise we handed out a letter of complaint to your Customer Service on the ship, there was a follow up done by your personnel. to see twice my family doctor for more medication. I think with all the passengers and crew sick, it is the reason why I got pneumonia. That cruise was a nightmare for me and my husband. Awaiting to hear from you in regards to this cruise, we beleive that a compensation should be look in. I took a Baltic Cruise along with my mother on 24th September. The starting port of the cruise was changed one day before departure. For this I had to change my flights to Copenhagen instead of Berlin. I asked for compensation for the costs involved in the change. This was accepted by Norwegian Cruise line with a compensation of US$ 600 vide their case number 02147307 dated 23rd October 2018 by Susan Worthy of NCL Guest Relations, also confirming my credit card number for refund. This was confirmed the same day by me. Inspite of repeated reminders over the last 2 months the amount has not been paid to me and no response to my mails! I have tried calling the NCL number on phone from India (where I live) and the call centre keeps call waiting for over 15 minutes, forcing me to disconnect! I expect the refund immediately. guest services desk. The guest service representatives informed me to contact the corporate office with any complaints. In closing the service I received on this sailingwa snot good, the smell never left my stateroom. I am very displeased with the managerial staff. The managerial staff have no communication skills. All staff directed me to another staff member. The service was unacceptable and degrading. and family GRP#A6566661. After having this awful and disgusting experience I received on this cruise, I am very surprised at NCL service. It saddens me to inform you I really have to cancel my upcoming sailing on NCL BLISS. Change to the previous submitted complaint. Removed Los Angeles to San Diego. My name is Anthony Merriman and I have a complaint that I want to let you know about. I went on a cruise on the Norwegian Bliss. My Reservation# 35579525 and the Group# A685071. The dates of the cruise was October 20–27 of 2018. We departed on October 20, 2018. We got about one hour out from the port of Long Beach. This is when they announced that there would be an itinerary change to our cruise. This was due to the bad weather in Mexico. They announced that the cruise would be going to San Francisco, then San Diego, then Encinitas. Those ports were not where I signed up to go. I live in Southern California and was raised in Northern California. Those are places that I go on a regular basis. My real complaint is that I was not giving an option on if I wanted to continue or cancel. Since the cruise was only about one hour from the port. I felt that there should have been some type of option. I do want to let you know that I did enjoy the cruise and have already put down a deposit on another Norwegian cruise. I feel that there should be some kind of justification on why there was not a choice in this situation. I’m just looking for solutions on this matter since I did pay for the cruise and didn’t go to where I wanted to go. And just to be clear I’m not looking for a refund. I’m looking to find out if there was any other way that this issue could have been resolved. 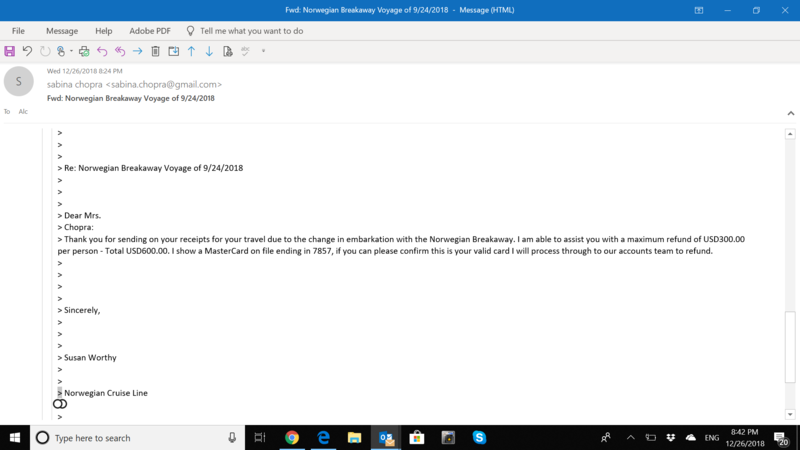 Hi....the email below was submitted to Norwegians Customer Support on 08/30 as I was advised to do so after spending 10 hours on the phone with different reps at Norwegian during the week on Aug 23rd. I have yet not heard from them. We were not able to make the trip as there was a Category 4 Hurricane hitting the Hawaiian Islands. All United Airline flights into Honolulu were cancelled starting Thursday, August 23, 2018. Even the cruise itself was delayed by almost 3 days due to the Hurricane. Tourists that were already on the island were forced to stay inside their room for multiple days while the Hurricane was passing thru the islands. We had a group of 10 people with ages ranging from 6 to 80 years old. We had 4 Senior Citizens in our group. Majority of the people in our group would not have been able to handle the landslides and flooding that happened on all the islands. There was rain of up to 30 inches on the islands. We are a family that travel on a regular basis. This was our first trip as a family on a cruise and wanted it to be a good experience. We would hate to leave with a bad experience with NCL. We do appreciate the fact that a “two day” credit will be provided for all passengers due to the fact that the cruise ship sailed two days late. But, I am not sure you realize that trying to get into Hawaii during those days was nearly impossible. There were hardly any flights and hotel rooms were extremely difficult to find. Please accept this letter as my official request for you to credit us our full fare of our trip. I am sure we will book this trip again with you at a later date when it is convenience for the entire family. I assure you that you obliging to this matter will create great reputation with us as well as our friends and family. I have decided I will pretty much no longer cruise w/ NCL. And no way to place a complaint via email as a complaint to customer service (which only questions further the issues at hand. Though the deposit is minimal, it how NCL practices. RCL and CCL send out reg notices about payments due. Paying 120 in advance without notices is simply a bad practice. I called as soon as I rec'd the ph call. One could argue why would I have not responded to an email. I feel that it is a play on NCL to hold deposits. Had this similar issue in that past, which left a bad taste in my mouth. FYI - My credit score is over 800. I try my best to keep track of making payments. Silence by NCL (from my perspective), is simply bad business practices. Funny how I rec'd three emails from NCL as soon as I canceled. And that two accts had to be merged. History emails below. Not pleased, and NCL should learn some practices from CCL and RCCL in service. CCL has improved so much in the past 10 years, where NCL I fell has reversed course. rec'd 7-27-18 after my phone call. Please find attached to this e-mail your cancellation confirmation. You can reach us at 800-327-7030. Norwegian Cruise Line is making a nominal adjustment to its daily service charges, effective April 1, 2018. Norwegian's discretionary daily service charges make it easy for guests to provide gratuities to the onboard staff dedicated to delivering superior guest service throughout the cruise. Any guest that has made a booking by March 31, 2018 will have the option of prepaying their service charges at the current rate if done prior to sail date. Guests with existing cruise reservations who have already pre-paid their service charges at the current rate are not affected. Service charges can be prepaid in the Vacation Summary section on My NCL. Pete Sokowski MD Associate Broker, GRI, CMHS (Certified Military Housing Specialist). Information About Your Cruise Account. Click here to view this message online. We recently noticed you had multiple accounts on file with us. No worries. We’ve merged them into one account and captured all your cruise history in one convenient place. Use it every time you book a cruise on Norwegian Cruise Line, and we’ll be sure to record your loyalty. In the meantime, simply register or log into ncl.com/myncl to review your account information. If you have any further questions, call us toll-free at 800-327-7030. Thank you for choosing Norwegian Cruise Line! P.S. Please save this email, so you’ll always have your account information handy. �2011 NCL Corporation Ltd. SHIPS� REGISTRY: BAHAMAS & UNITED STATES OF AMERICA. Add NorwegianCruiseLine@email.ncl.com to your address book. If you would prefer not to receive further messages from this sender, please click here. When I booked my cruise on the Pearl leaving from New Orleans on March 11 2018, I specifically told the agent I was speaking with that I wanted to upgrade to a window. And I specifically told her that by a window I did not mean a Porthole Window. I meant a real SQUARE window. I have claustrophobia and a Porthole window is just not acceptable for me. Anyway, when I got on the ship and went to my cabin it was a Porthole NOT a bigger SQUARE window. I went to guest services to ask for a different cabin but there was none available. This is my third cruise with Norweigian. The first one I upgraded to a balcony which I really loved. Then the other two I upgraded to a window and got the SQUARE window I had asked for. This time I did not get what I asked for. This cruise was very uncomfortable for me with my claustrophobia and I am requesting a refund for the upgrade. Hoping to hear from you very soon. Sailed on the Jewell from October 9 - 16 -16. The trip was to include Mazatlan, Cabo San Lucas and Puerto Vallarta Mexico. Due to engine trouble we were stuck at Puerto Vallarta and never saw the other cities. I feel that NCL owes me the trip I paid for. The staff, food, shows could not have been better. Reservation # 33495499 thru Holiday Planners with MiKE HALL---Irma Displacement from Florida resident to Ohio----booked a cruise back in March as a surprise anniversary gift to my husband. ( First time cruisers) Everything was in place till Irma. We evacuated our home as we were instructed by the governor of Florida heading north to stay with family in OHIO, not sure is if we would have our home to return to. Made many attempts to contact our ghost travel agent and was told, well if the ships sails it sails. explained our situation and was then told so you might have to clean up a few branches off the road.--no help trying to figure out something. no ins was purchased because Mike stated " I don't think you need it , I never purchase it" Then once we reached Ohio , contacted Holiday Planners again, spoke with Peggy to see if there was anything that could be done. Peggy contacted Mike who phoned me and was upset that I contacted Holiday Planners. No help again as his solution was to purchase two airline tickets and buy some new clothes and go to Miami for the cruise. Like everyone has the money to do that!! I have worked many long hours to pay for this trip and am very disappointed that no one could help us with a solution to this issue. I am not looking for a refund for the cruise, just a rebooked this cruise for another time. spoke with Josephina EX 26632 was told to file a claim asap. Norwegian corporate. It's mr tahir mehmood my ticket ref is 8idq5j. I was at the airport on time 45 mint before my flight front of Norwegian check in desk and request them plz I want to check in so she call to Norwegian department and holding no answer and again dial and holding no answer after 10 mint she said go to sky desk and make a new ticket so. My complaint is this if you mentioned on your web site minimum 45 mint left we are allowed to check in then why your staff waste time and after they left and she said you have to buy new ticket so I missed my meeting plus I did pay extra £151. And bought new ticket and your staff which sitting on desks specially today 21 Jan short hair shaft girl was very bad behavior and rude attitude. Really I am very regular traveler and I love to travel with Norwegian so please ask your staff and check your system why they not except my check in and second I will be appreciate if you compensate me about this happen. We were delayed in San Francisco waiting for flight 1964 to Seattle on 6/21/15. The flight never took off and we missed the NCL Pearl sailing from Seattle. We called NCL and wanted to cancel our shore excursion we were told by Whitney if we were not on the ship we would not be charged the $398. We joined the ship in Juneau about 3:30 PM on Tuesday and went to our room at 3:50. At check in we inquired about the tour and was told we had not been charged for it. NCL now is saying we still have to pay for the tour even though their employees assured us we would not have to. Document every conversation when talking to NCL they do not keep their word! We were delayed in San Francisco waiting for flight 1964 to Seattle on 6/21/15. The flight never took off and we missed the Norwegian Cruise Lines Pearl sailing from Seattle. We called Norwegian Cruise Lines customer service and wanted to cancel our shore excursion we were told by Whitney if we were not on the ship we would not be charged the $398. We joined the ship in Juneau about 3:30 PM on Tuesday and went to our room at 3:50. At check in we inquired about the tour and was told we had not been charged for it. NCL now is saying we still have to pay for the tour even though their employees assured us we would not have to. Document every conversation when talking to Norwegian Cruise Lines corporate office, they do not keep their word! Booked the Epic with 13 people for march 8th-15 we usually book on ‪#‎RoyalCaribbean‬ but decided to try out ‪#‎Norwegian‬ ‪#‎NCL‬ on the ‪#‎Epic‬ Well we had some health issues and asked if we could move the dates around, not cancel they were not very accommodating! Before all that we moved some people around so that we could take advantage of the ultimate drink package with 11 adults going they allowed us to do it. This week my wife called to move 1 of us around for the drink package because she could not drink and they told us that the package was only available now for the first 2 in the room so they lied originally and lost or could not find the conversation we had previously when we were promised this. Long story short this will be are first and last cruise with Norwegian, there customer service is absolutely horrible, never have we been treated so poorly for a cruise, This was not for 2 people but 13 way to go Norwegian wont be recommending your cruise line. They probably wont post this on their site but I am sure it will be on all my social media. How convenient #NCL website has changed there policy for the #ultimatedrinkpackage regarding this problem .#NorwegianCruiseLines also stated when we called that they were experiencing high volumes of the same complaints from customers. This was pre cruise. Well #NCL didn't let us down after getting on the ship service was absolutely horrible! Bars were understaffed no waiters on the pool deck, slides were closed down most of the time, restaurants took for ever serving you or even getting you a drink, I could go on and on. Now this was not our 1st cruise by any stretch combined with my family between 15-20 mostly on RC and Princess but our 1st on NCL and our last, that bad. Yes we know there is contractual agreements and we did not take out Insurance. The customer service people and cruise staff were just down right rude and non compassionate, We sucked it up and went on the cruise. Have feedback for Norwegian Cruise?